When it comes to renewing your wall displays, it can be a hard decision whether to choose a traditional whiteboard or opt for a glass writing board instead. Well, until now we’d have agreed that you can’t go wrong with a traditional whiteboard. However, we’ve just discovered a range of premium glass boards that have got us a little excited. Here are 6 reasons why you should take the leap and invest in a premium glass writing board. Our range of magnetic glass writing boards feature a wall mounted, mobile and a desktop lapboard option. Available in several sizes to suit your application needs. The smallest wall mounted glass board is 350mm x 225mm and is perfect for mounting outside meeting, training, seminar or classrooms to highlight what is taking place inside. The largest mobile glass whiteboard is 1800mm x 1200mm and can also be used as a mobile room divider, perfect for creating a secluded area for client meetings. Choose to have your magnetic glass board plain in 15 vibrant colour options, with a printed logo, or with a fully customised design. Also available, is a lapboard style desktop glass writing board. This is mounted onto a steel frame and is ergonomically designed for ease of writing. When not in use you can hook the desktop glassboard over a desktop office screen to maintain and clean and glutter free work space. 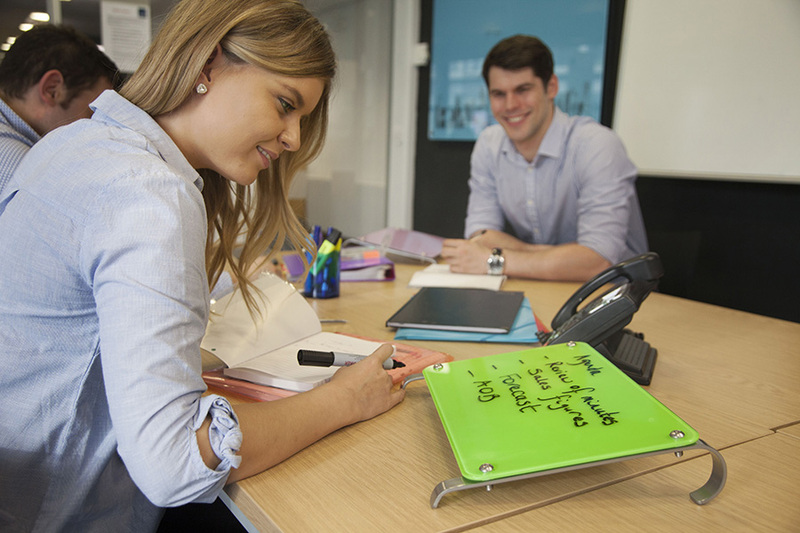 Our premium glass whiteboards are manufactured from a high grade 4mm toughened safety glass which is suitable for use in educational establishments. The tempered safety glass is chemically treated with heat which makes the glass super strong and durable. The steel back plate is what gives our glass writing boards the magnetic properties for use with strong magnets. The frameless finish and rounded, polished corners, make these glass boards safe for use in educational establishments. The standoff fixings are incredibly strong and have been designed to hold the glass boards firmly in place. Our wall mounted, mobile and desktop glass whiteboards are available with a custom printed design. This enables you to create a unique design which is tailored towards where the glass writing board will be used. For instance, you could create an interactive brainstorming board for encouraging interaction and engagement in training and learning rooms. The desktop writing board can be printed with a weekly planner to ensure you stay on top of your tasks during a working week. The wall mounted, and mobile magnetic glass writing boards can also be printed with a company or school logo. This allows you to keep a professional corporate brand image throughout your business premises. Traditional whiteboards may be functional and necessary, but they are not the most aesthetically pleasing. Glass boards however, are not only functional, versatile and very useful, they also create a modern and contemporary aesthetic which fits nicely into almost any environment making them a very popular choice. Manufactured with toughened safety glass, these glass whiteboards come with a lifetime surface warranty which means they wont ghost, stain, fade or chip and will always look just as good as the day you purchased it. For more information on our range of magnetic glass writing boards please contact us or call us on 01733 511030.